Fans of the time tested Fluke 743B have a reason to rejoice! Fluke presents the new and better Fluke 753 as a direct replacement for the ever popular Fluke 743. There is no need to retrain technicians, the new user interface is nearly identical to the popular 740 series calibrators and an improved display makes these new calibrators a winner for those used to using 740 series calibrators. 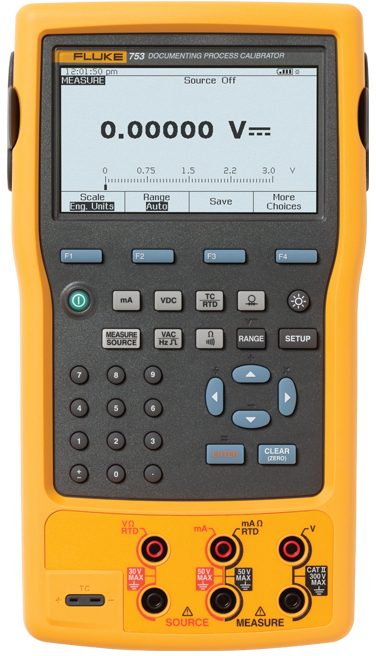 Improvements include a new brighter, bigger and easier to read display, HART (Fluke 754 only) connectability through the mA terminals, improved test lead set, Li-ion battery, improved RTD accuracy and more. 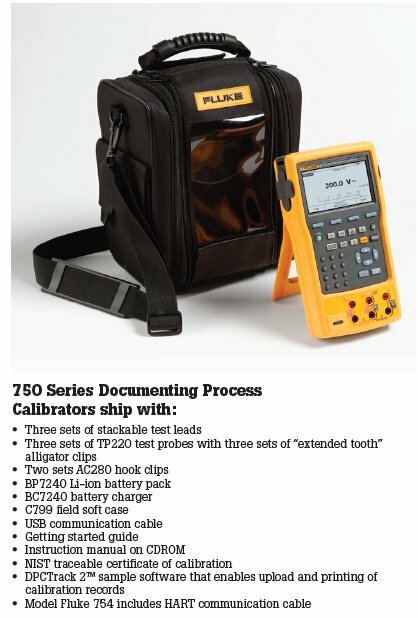 Added bonus, the new 750 series DPCs include the innovative new C799 Field Softcase. 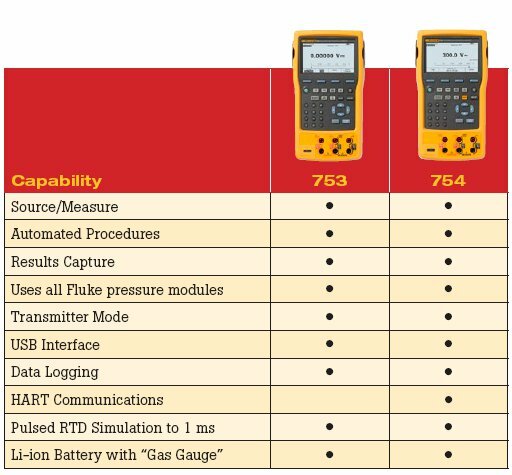 The Fluke 753 Documenting Process Calibrator automates calibration procedures and captures your data. Use the PC interface for downloading procedures, lists, and instructions to the 753 and for uploading data for printing, archiving and analysis. The 754 includes integrated HART communication capability. This rugged, reliable tool is ideal for calibrating, maintaining, and troubleshooting HART and other instrumentation. Pressure Modules - Covers virtually any pressure application including gauge, differential, dual (compound), absolute, and vacuum. A family of 29 optional pressure modules provides pressure calibration and measurement capabilities. Twenty-eight modules are available, with basic accuracy specs to 0.05%. Ranges start at 0 -1 in H20 (0 - .25kPa) and go to 0 -10,000 PSIG (0 — 70,000 kPa). Additional information about pressure modules is available. Automated Procedures - Allow you to quickly set up powerful, automated calibration procedures for linear transmitters, DP flow transmitters, and one- and two-point limit switches. Simply select the appropriate measure and/or source functions and fill out the procedure template. The 750 Series does the rest. It quickly performs the test, calculates the errors, and displays the final results, highlighting out of tolerance points. Custom Units - Enable you to map one unit to another, such as mV to ºC or ºF. 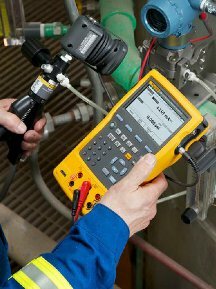 Allows you to use the Fluke 750 Series with millivolt output accessories such as the Fluke 80T-IR Temperature Probe, and to document tests using non-supported units such as parts per million or revolutions per minute. User-entered Values - Enables technicians to record calibration results that were sourced and/or measured by other devices such as panel meters or readout-only devices. Limit Switch Calibration - Procedures perform fast, automated calibration of one and two-point limit switches for voltage, current, temperature, and pressure. Differential Pressure Flow Instrument Calibration - Routines use a square root function to directly calibrate DP flow instruments. Additional Features - Multifunctional - Calibrate temperature, pressure, voltage, current, resistance, and frequency. Since it both measures and sources, you can troubleshoot and calibrate all with one rugged tool. Powerful, yet easy to use - The easy-to-follow menu-driven display guides you through any task. Get up to speed in minutes, not days. Programmable calibration routines enable you to create and run automated as-found/as-left procedures to ensure fast, consistent, calibrations. Records and documents results - To support your ISO-9000 or regulatory standards the Fluke 753 captures your calibration results, eliminating the need to juggle a pen and pad in the field. The USB interface lets you transfer the results to a PC, thus saving the time of having to manually transcribe them when you return to the shop. Truly hand-held - Small enough to fit easily into a tool bag and to use in tight spaces. Runs an entire shift on a rechargeable Li-ion battery pack. Rugged and reliable - Count on Fluke's rugged design to deliver top accuracy and reliability in harsh environments. Overmolded urethane case stands up to rough handling in industrial environments. Bright white display - Lets you read your results in any kind of light. Backlight has three (3) settings. Soft keys - Provide one-touch access to enhanced functions such as task lists, automated procedures, scaling, min/max, stepping and ramping, and review memory. Three operating modes - Measure, Source, or simultaneous Measure/Source, - enable technicians to troubleshoot, calibrate, or maintain instrumentation with just one tool. Multi-lingual interface - Displays instructions in English, French, German, Spanish, and Italian. Built-in algebraic calculator - With four functions-plus square root-stores, recalls, and performs calculations required for setting up instruments or evaluating data in the field. Use it to set the source function to a calculated value. There's no need to carry a pencil and paper or a separate calculator.